A wedding day in the hot summer sun can be tough when you are a ringbearer wearing a nice piece of formal attire. As a wedding ceremony progresses, it can be a wonderful time to search for details and reactions. I have always enjoyed photographing children at weddings simply because they are not adults and don’t always hold themselves at one hundred percent attention during a ceremony, especially during a sermon. After photographing the minister once or twice, I always turn my attention on the attendees and guests watching and listening. Moving inconspicuously around the front can yield to so many outstanding moments and expressions. 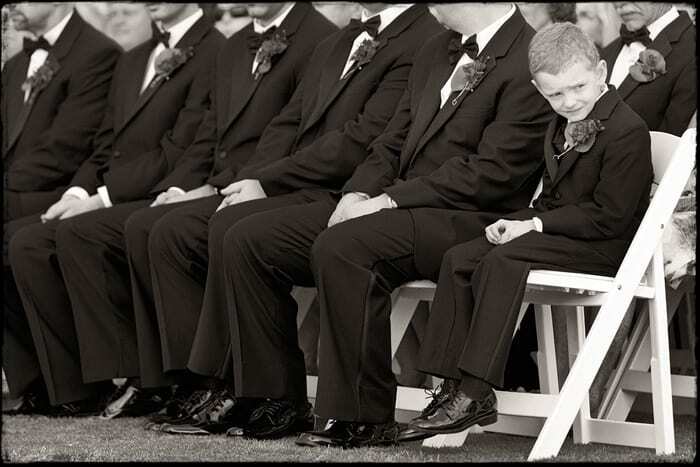 This photograph is composed in a simple fashion, with the repetition of the groomsmen providing simplicity to the image. My subject, the ringbearer, is off to the right and looking out of the frame. He has a priceless face and it made an excellent choice as one of my many favorites.